Save Up To 60% OFF With Esquire Photography Partner: Simply Bridal During Their Annual End Of The Year Clearance Sale! Good morning from Esquire Photography HQ everyone! Well also I’m excited to share an awesome YEAR END SALE announcement I received from my partner; Shelly at Simply Bridal! This will totally help you save some money on your Wedding Budget and for the holiday season! Bridesmaids/Special Occasion Dresses Sale – 60% all styles! Not a bridesmaid? But, need a nice evening dress for holiday parties, or just a nice date? SimplyBridal has your dress! 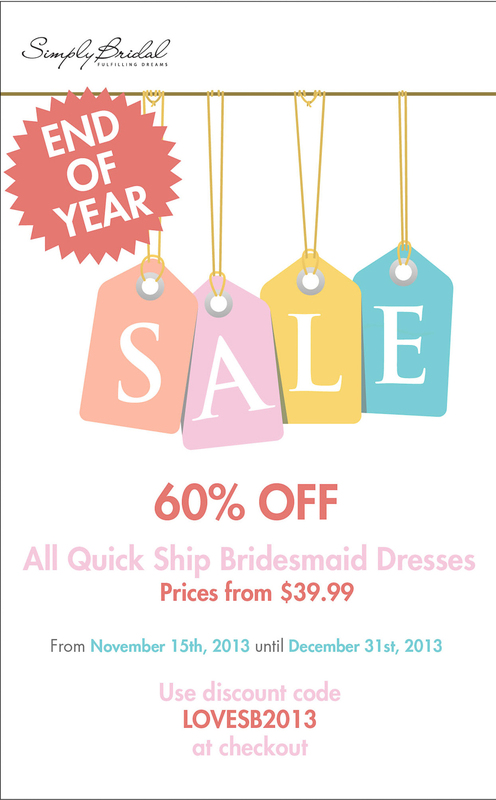 All bridesmaids dresses from our Quick Ship selection are 60% off their already discounted prices! View the full collection here (http://www.simplybridal.com/shop/quick-ship?type=bm). Use the discount code “LOVESB2013” in the checkout window and experience the savings instantly! Is this an awesome money savings tip to kick off your weekend or what?!? Also, if you would like to chat about your upcoming event or wedding – totally comment below or feel free to contact me anytime day or night. I’m available just about 24/7 via Twitter, Facebook, Google+, the form on my contact page, or the old fashioned phone as well at 888.ESQ.PHTO (888.377.7486) or 562.225.5915. I hope you’re having a great start to your weekend AND totally be sure to check out Christin & Christoph’s Destination Wedding in Germany. There were over 10,000 photos I captured as a destination wedding photographer & I’m so excited to share them with you! To help another couple save some $ and have the wedding of their dreams with the right photographer!